Although January is on average the coldest month in Athens, its temperatures are mild and can be a welcome escape from the freezing winters of northern Europe. The average temperature this month is 10°C (50°F), while the average low is 7°C (45°F), and the average high is 13°C (55°F). The beginning of the month brings mostly cloudy days, with a decent chance of rain, and an average daily temperature of 9°C (48°F). The middle of the month sees more clouds and a greater chance of rain, while the daily average temperature increases slightly to 10°C (50°F). The end of January is much like the middle, with the same average daily temperature and mostly overcast days with an increased chance of rain. The lowest ever recorded temperature in Athens in January is -2°C (28°F), while the highest ever recorded temperature is 21°C (70°F). Along with being one of Athens’ colder months, January also brings very little sunshine. The daily average sunshine this month is just three hours, which is tied with November and December for the least amount of sun in Athens of any month. Coinciding with the small amount of sun is a fairly high chance of rain for Athens’ standards. The average rainfall in January is 40mm occurring over nine days. In the grand scheme of things, this is not a large amount, but it is the fourth highest total of the year on average for Athens. The average humidity in January is 70%, which is relatively comfortable and with the colder temperatures, will likely be unnoticeable. There are also an average of zero snow/fog days in Athens in January, so if you are looking for snow, held elsewhere. AVA Hotel is a four-star facility offering a variety of suites for guests to choose from. All rooms come with air-conditioning/heating, wireless Internet, as well as a balcony. The view from the balcony depends on the room, but some offer views of famous sites, such as the Acropolis or the Temple of Zeus. Based on these views, the draw to this hotel is its location. Many of the best historical sites are just minutes away by walking, making them incredibly easy to access. The AVA Hotel is about a 10 minute walk from the city centre. Brasil Suites offers a choice of junior, senior, family, and superior suite options, each coming with a marble bathroom, a kitchen equipped with everything you would need for cooking, a living room and dining room area, and a private balcony. They also have an on-site restaurant offering both Brazilian and international dishes, as well as a pool where snack and cocktails can be enjoyed. Their guest services can also help arrange tours of the nearby sites. Brasil Suites is located about a 20 minute drive from the city centre. 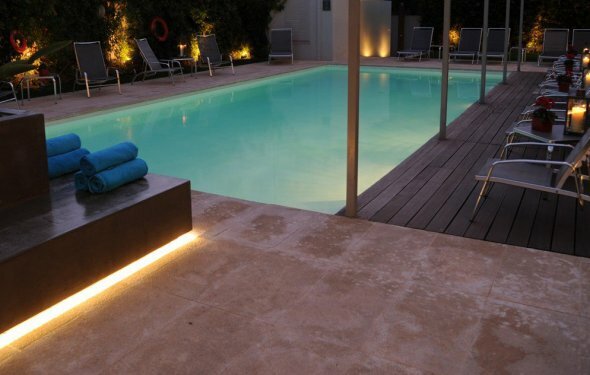 Swimming Pool at Brasil Suites, Athens. In order to learn about some of Greece’s history, check out the Acropolis Museum, which has over 14, 000 square meters of exhibition space, and is home to slopes of the Acropolis, statues, Athenian artifacts, and much more. The museum is open from 9 AM to 5 PM Monday to Thursday, 9 AM to 10 PM on Friday, and 9 AM to 8 PM on Saturday and Sunday. There is a fee of €5 to enter and they are located about a 13 minute walk from the city centre. Athens is famous for its temples and the Temple of Hephaestus should not be overlooked because of its condition. The temple is in great shape and much of it remains exactly as how it was built, which took place around 415 BC. The name of the temple comes from “Hephaestus, ” who was the god of “metal working and craftsmanship, ” and this was likely chosen to do the workshops close to the temple that practiced such things. The Temple is about a 15 minute walk from the city centre. Glyfada Beach is a sandy beach that has both public and private areas. Although you won’t be fighting anyone for space in January, the private sections are predictably less crowded. If you manage to catch a warm day this month, swimming in the crystal clear water here is great, just be sure to pay attention to boats as there are harbors close by. Located about two blocks off the beach is The Burger Times, offering burgers, hot dogs, sandwiches, wraps, and beers/cocktails. Glyfada Beach is located about a 19 minute drive from the centre of Athens, and city buses and the tram go here as well. Vouliagmeni Beach is worth visiting even during the “off-season” for beaches because of its facilities. They have volleyball and tennis courts, as well as a play area designed just for children. If you do get warm, they also have a water slide and a great swimming area. The beach itself is made up of sand and pebbles and during the 2004 Olympics, part of the triathlon competition took place here. Located just off of the beach is Matsuhisa Athens Restaurant, which is part of the Astir Palace Resort, and their specialties are sushi and martinis. Vouliagmeni Beach is about a 25 minute drive from the city centre. Funky Gourmet is exactly what it sounds like – fine dining that is presented in an unusual, but stimulating way using local ingredients. They offer three types of tasting menus with dishes like Greek bottarga, scallops, and lamb, and desserts like a “smoked ice cream sandwich” and chocolate soup. They also have a massive wine list, while also serving a variety of beers and cocktails. They are open from Tuesday to Saturday, just for dinner, from 7:30 PM to 1 AM, and are located about a five minute drive from the city centre. Schinovatis Cafe Bar offers the chance to step back in time, while also enjoying a delicious cocktail. As a café, they also serve food, but it is recommended to head here for the drinks. Their bartenders are capable of mixing any type of drink imaginable, while providing friendly service. Schinovatis also often plays “old-timey” jazz music, further adding to the old-school, relaxed scene. They also serve a variety of excellent coffees and are located about a 20 minute walk from the city centre.